"For something a little bit different and a whole lot delicious, make this autumn pumpkin cheesecake instead of pumpkin pie for your Thanksgiving feast." Combine graham cracker crumbs, sugar and butter; press firmly on bottom of 9-inch springform pan. In large bowl, beat cream cheese until fluffy. Gradually beat in sweetened condensed milk until smooth. Add pumpkin, eggs, maple syrup, cinnamon, nutmeg and salt; mix well. Pour into prepared pan. Bake 1 hour and 15 minutes or until center appears nearly set when shaken. Cool 1 hour. Cover and chill at least 4 hours. 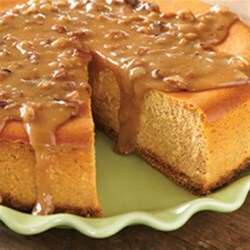 Maple Pecan Glaze: In medium-sized saucepan, combine whipping cream and pure maple syrup; bring to a boil. Boil rapidly 15 to 20 minutes or until slightly thickened; stir occasionally. Stir in chopped pecans. Cover and chill until served. Stir before serving. Very good! Everyone at Thanksgiving loved it!